Ashok Radadiya consoles his flood affected sister Sudhaben Bhalala upon her arrival in Ahmadabad. 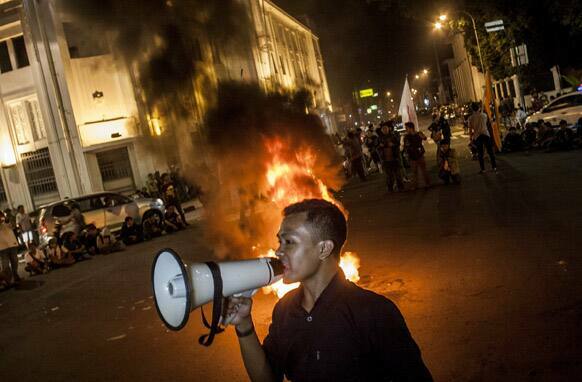 An Indonesian student shouts slogans as tires are burned during a protest against the fuel price hike that was just announced by the government in Yogyakarta, Indonesia. 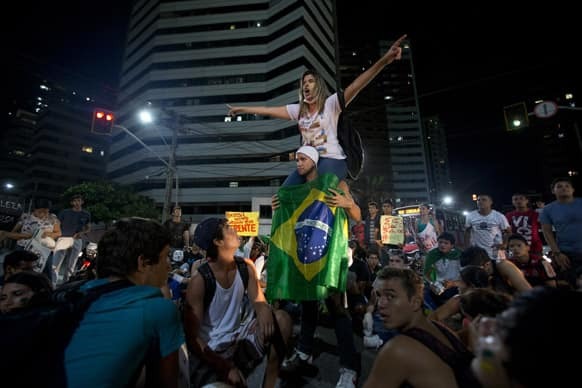 Activist Luana Carvalho, climbed on the shoulders of a demonstrator that holds a Brazilian flag, instructs a group of fellow protesters to block a street during a demonstration in Fortaleza, Brazil. 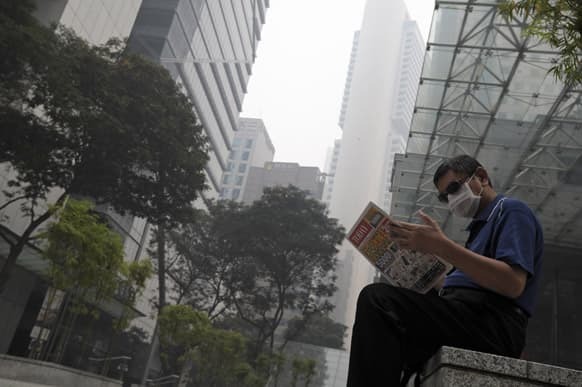 A man wears sunglasses and a mask to protect himself from a haze as he reads a newspaper in the Central Business District in Singapore. 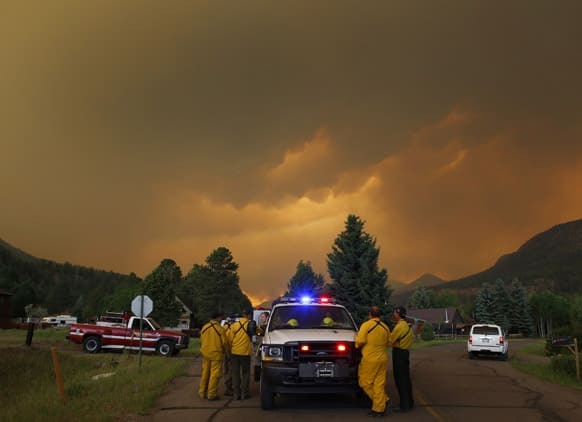 Firefighters stage in a residential area in South Fork, Colo., as they monitor a wildfire that burns west of town. The town was evacuated and US 160 that passes through it was closed. 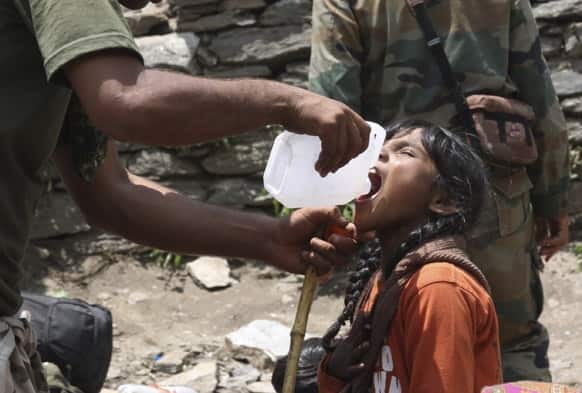 An Indian army soldier helps a young girl, affected by floods, drink water before evacuating her from the upper reaches of mountains, in Gaurikund, Uttrakhand. 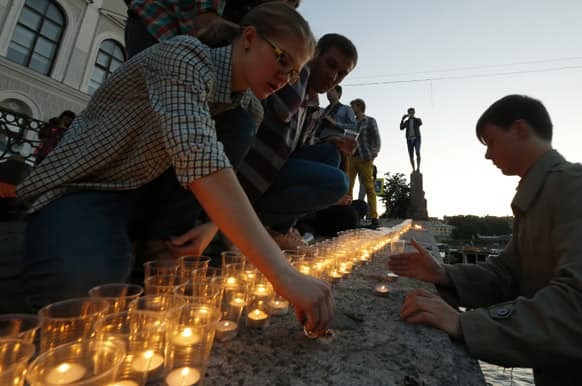 Young people light candles at Fontanka River embankment near a monument for the WWII victims early morning, at the time the Nazi Germany attacked the Soviet Union 72 years ago, in St.Petersburg, Russia. People lighted 1,418 candles, the numbers of the days of the war. US Ambassador to Qatar Susan Ziadeh walks with US Secretary of State John Kerry and Ambassador Ibrahim Fakhroo, Qatari Chief of Protocol, on Kerry`s arrival in Doha, Qatar. Protesters march with a flag of the Pan-Malaysian Islamic Party during the "Black 505" rallies nationwide to protest electoral fraud, in Kuala Lumpur Malaysia. 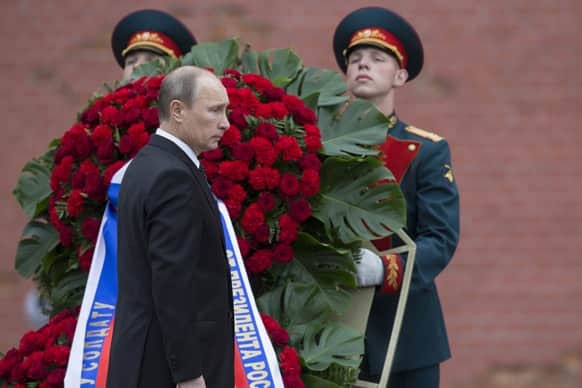 Vladimir Putin takes part in a wreath laying ceremony at the Tomb of the Unknown Soldier outside Moscow`s Kremlin Wall, in Moscow, Russia, to mark the 72nd anniversary of the Nazi invasion of the Soviet Union. 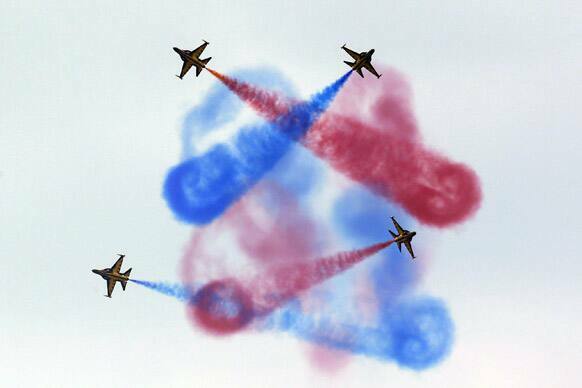 South Korean Air Force aerial demonstration team, the Black Eagles, performs during a ceremony for a re-enactment of the battle of Chuncheon in Chuncheon, north of Seoul, South Korea. 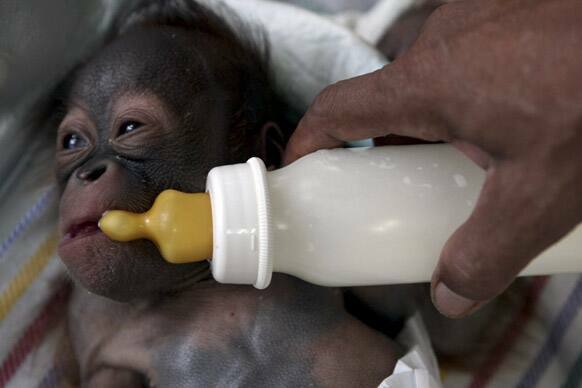 A keeper feeds milk to Rizky, a 11 day-old orangutan as he lies in an incubator at a nursery of Surabaya Zoo in Surabaya, East Java, Indonesia. 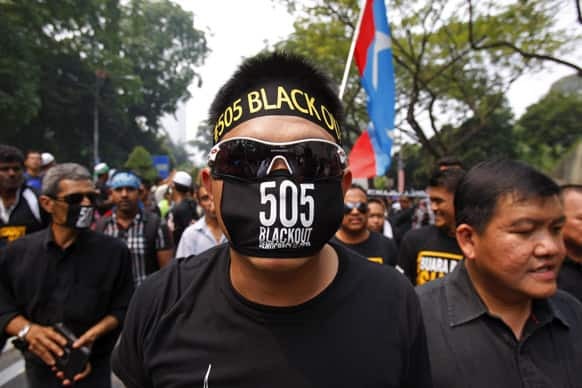 A protester wearing a black mask participates in the "Black 505" rallies nationwide to protest electoral fraud, in Kuala Lumpur, Malaysia. 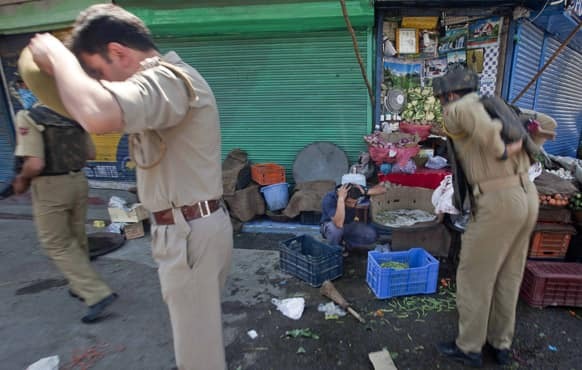 A Kashmiri shopkeeper reacts in fear as policemen arrive near the site of a shootout in Srinagar. A top police official said suspected militants have shot and killed two police officers in Kashmir. 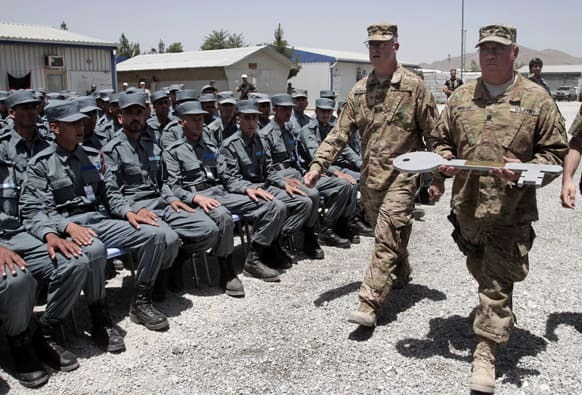 Afghan soldiers watch two US Army officer carry a giant symbolic key during the fifth phase of a transfer of authority ceremony of the police academy from NATO-led troops to Afghan security forces in Kabul, Afghanistan. 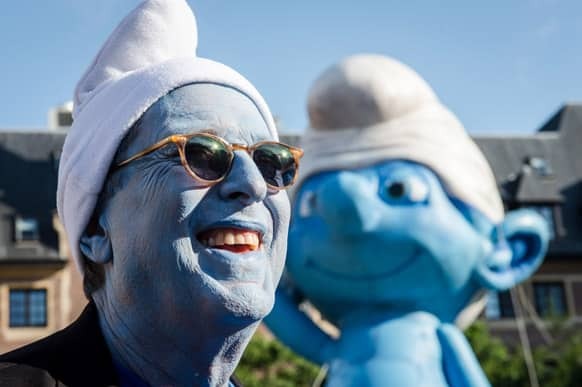 US film producer of the Smurfs 2 movie Jordan Kerner smiles as he stands in front of a giant inflatable Smurf during the Global Smurfs Day gathering in Brussels. 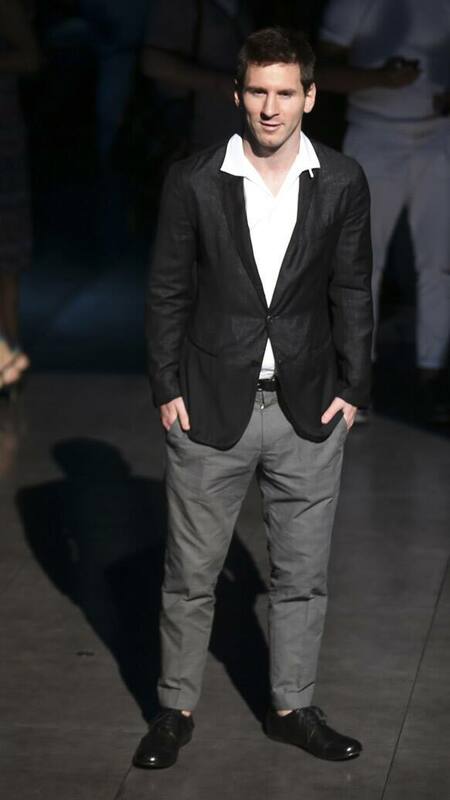 Argentine soccer star Lionel Messi poses in front of photographers prior to the start of the Dolce & Gabbana men`s Spring-Summer 2014-15 collection show, part of the Milan Fashion Week, unveiled in Milan, Italy. 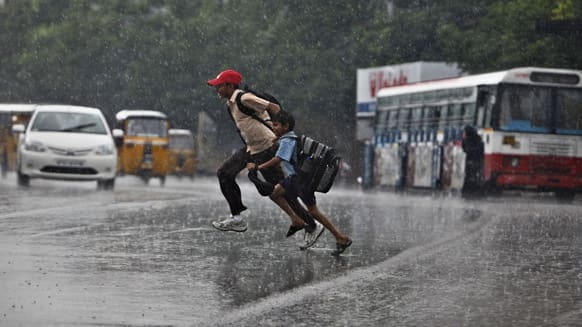 School children run to cross a street during rains in Hyderabad. 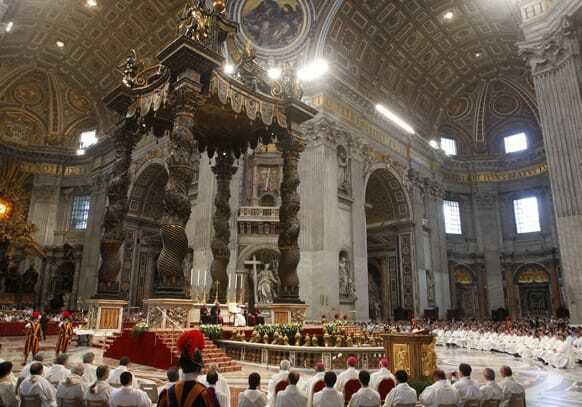 Pope Francis speaks to faithful at the end of a Mass celebrated by Brescia`s Bishop Luciano Monari, not pictured, in St. Peter`s Basilica at the Vatican. 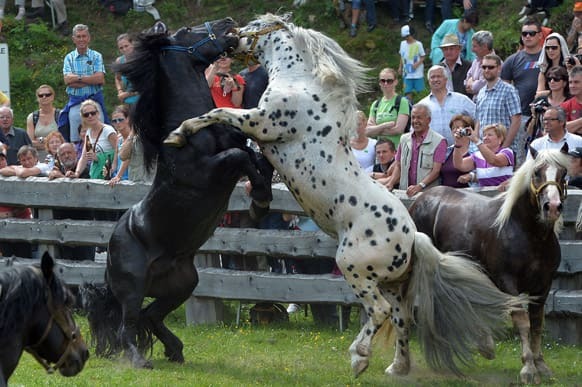 Stallions fight for their position in the herd in Rauris in the Austrian province of Salzburg. To avoid such fights and injuries on the alp, the horses fight for their leadership of the herd in a paddock. An Indian Air Force (IAF) cadet hugs his mother after participating in the passing out ceremony at the Air Force Academy in Dundigal, 40 Kilometers (25 miles) from Hyderabad. England`s captain Alastair Cook and India`s captain Mahendra Singh Dhoni pose with the trophy ahead of Sunday`s ICC Championship Final at Edgbaston, Birmingham England.